Examination of the shocking fall of the richest man in Revolutionary America. Smith (History/Virginia Commonwealth Univ.) 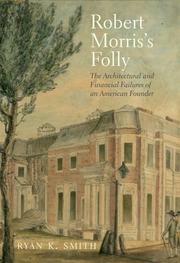 wisely focuses on the dizzying last few years of Robert Morris’ (1734-1806) life, from the height of his wealth and free-wheeling speculation in 1793, when he began planning an extravagant mansion for himself and his family in Philadelphia, to his incarceration in debtors prison six years later and penurious death in 1806. How could this disgrace have happened to the nation’s first “superintendent of finance,” appointed unanimously by Congress in 1781? Morris was an English immigrant who worked his way up as a merchant, becoming a partner in the trading firm Willing, Morris and Company at age 21. He was elected to Pennsylvania’s state assembly (and later, senate), and he was instrumental in building the republic’s navy, equipping the army, funding the states, stabilizing the currency, paying the government’s debts and establishing the Bank of North America. These and many other exalted tasks won him lifelong friendships with the leading Founding Fathers, such as George Washington, who dined with him in jail. A risk-taker with “an appetite for action,” Morris fell into the lure of land speculation, as many other leaders did, buying up millions of acres of land in upstate New York, as well as floating numerous industrial ventures. The clincher was his relationship with engineer and architect Pierre Charles L’Enfant, who had designed the layout of the new capital, Washington, D.C., before resigning in a sulk. Together, the two allowed their overweening ambition and sense of persecution to propel the erection of a grand mansion on an entire block of Philadelphia purchased by Morris. It was a gorgeous “folly,” doomed to incompletion and eventual dismantlement by the resentment of the republican masses. Sharply focused, wonderfully engaging documentation of the “ruins” of this American Ozymandias.